There are just a few more days left to enter the ‘LIKE’ contest on author Tim ‘Dr. Hope’ Anders’ Facebook Fan Page. The first winner will be picked this Easter Sunday evening. 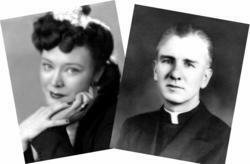 The Broadway actress and the Caholic priest. Dr. Hope, is having multiple contests where he will be giving away autographed First Edition copies of his critically acclaimed books to promote his Facebook Fan Page. The first drawing will be on Easter Sunday with weekly drawings through the end of April. An Alpine Publishing spokeswoman said that the contests are free to enter, just click on ‘LIKE.’ The lucky winners even get to select which prize they want to win. “Got Kids? Pick an award-winning children’s book. Love Love Stories? Pick Everybody Calls My Father, Father, the true love story of my parents. Just go to http://www.facebook.com/TimDrHopeAnders and click ‘LIKE’ to enter, it’s that simple,” said Tim ‘Dr. Hope’ Anders. Everybody Calls My Father, Father, exposes to the world the hardships and heartaches that the author’s mother had to endure, at the hands of the Catholic church because of her secret and forbidden love with his father, a Catholic priest. The character of a tenacious young woman, Bouvette Sherwood (the author’s mother), who is a successful New York Broadway producer and actress, drives the plot. In the mid 1940s Bouvette meets and falls in love with a charming alcoholic, Hughie Hewitt. He has a secret though, which he keeps from her during their intense courtship—he is a Catholic priest. For years their steamy romance and covert living arrangements are successfully hidden from the suspicious eyes of the church. After spawning two children their deception becomes increasingly difficult to conceal. Their love story unfolds into a kaleidoscope of intrigue, suspense, betrayal, and romance. About Tim “Dr. Hope” Anders: Dr. Hope is an award-winning children’s book author who also writes books for grownups. For more information about him go to http://www.DrHope.com.